Within the partnership established with the Champalimaud Foundation, ISPA has become a participating institution of the PhD program in Neurosciences along with Lisbon’s “Nova” University and the Lisbon Technical University. 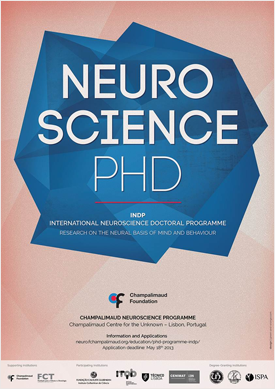 The main objective of the Neurosciences International PhD program is to grant the PhD students a wide set of skills, necessary to carrying out top scientific investigation within the area of Neurosciences. As such the program is divided between a first year of intensive theoretical training and in the next stage, the development of an investigative project which will lead to the presentation of a Doctoral thesis. The purpose of the initial training is to lay the foundations for the later development of ground breaking and multidisciplinary work in Neurosciences, be it basic or applied, focusing on the neuronal systems which are the basis of observable behavior. Beyond the theoretical training (classes and seminars), great emphasis is put in the practical training which is done in groups so as to incentive team work. Globally the Program’s objective is the acquisition of a scientific and investigative culture based on independent thinking, initiative, open mindedness and cooperation. We will soon publish news about future application deadlines. - Ability to comprehend the basic organization and operation of the nervous system, at a molecular, cellular and systemic level. - Getting familiar with the different and current Neurosciences techniques. - In depth knowledge of his specific investigation theme and capacity to evaluate and integrate the scientific results on his theme. - Capacity to formulate an investigative project, to plan and take the necessary steps in order to generate results as well as the capacity to interpret and evaluate those within the context of the project’s objectives. - Development of critical thinking, curiosity and scientific independence as well as a spirit of cooperation with his peers. - Ability to communicate with colleagues, the larger scientific community and the rest of society.